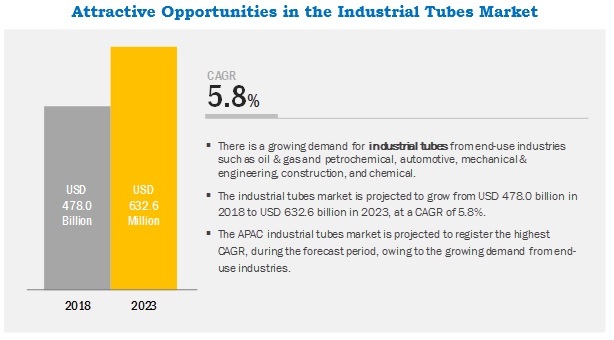 [133 Pages Report] The industrial tubes market size is estimated at USD 478.0 billion in 2018 and is projected to reach USD 632.6 billion by 2023, at a CAGR of 5.8%. Growth in the global petrochemical and chemical industry is the major driver for the industrial tubes market. In addition, the growing energy & power segment is also driving the demand for industrial tubes. Steel has high strength, high durability, excellent chemical and corrosion resistance, formability, and weldability due to which it has a high consumption rate. It is widely used in the manufacturing of these industrial tubes used in the chemical, oil & gas and petrochemical, energy & power, automotive, and many other industries. The steel segment, thus, dominates the industrial tubes market. Also, it is projected to register the highest growth rate during the forecast period owing to the rapidly growing end-use industries in emerging economies such as China and India. The oil & gas and petrochemical industry segment is projected to register the highest CAGR during the forecast period. The oil & gas industry is the dominant end user of steel tubes, and therefore the growth in oil & gas production is the major driving factor for the industrial tubes market. According to BP Statistics, the Middle East countries, the US, and Russia are expected to account for 69% of the oil production in 2040, a significant increase from 60% in 2016. The oil & gas sector is very important for seamless tube demand as approximately 50% of all seamless tubes & pipes are used for oil & gas applications including OCTG, topside process pipes, riser pipes, subsea flowlines, and heat exchanger tubes or instrumentation tubes among others. This has increased the consumption of steel tubes in the oil & gas and petrochemical and chemical industries. APAC is projected to be the largest market, in terms of value, during the forecast period. APAC has the largest populous countries such as China and India. These countries are rapidly going through capacity expansion in the petrochemical and chemical industry owing to the increased consumption of the chemical products. In addition, automobile production is also expected to grow significantly with the growth in the disposable income of the middle-class population. The industrial tubes market is, therefore, expected to experience a positive growth trend in the automotive industry. The construction industry is also expected to witness moderate demand for industrial tubes with the growth in the commercial infrastructure in key regions. Nippon Steel & Sumitomo Metal Corporation (NSSMC) (Japan), Vallourec S.A. (France), Sandvik AB (Sweden), Tenaris (Luxembourg), and Tata Steel (India) are the key players operating in the industrial tubes market. These companies have adopted various organic as well as inorganic growth strategies between 2015 and 2018 to strengthen their position in the market. New product launch and supply contract were among the key growth strategies adopted by these leading players to enhance their product offering and regional presence and meet the growing demand for industrial tubes from emerging economies. In September 2016, Nippon Steel & Sumitomo Metal Corporation established NIPPON STEEL & SUMITOMO METAL VIETNAM COMPANY LIMITED in Vietnam to cater to the steel tubes demand in the country. In July 2018, Vallourec S.A. developed copper tubes for the long period storage of wasted nuclear fuel. This project was undertaken in 2006, with a contract from customer Posiva Oy (France), a nuclear waste management organization. In November 2017, Vallourec S.A. received a contract to supply 16,000 tons of OCTG tubular solution to China National Offshore Oil Corporation (CNOOC), in Shenzhen, Shanghai, Tianjin, and Zhanjiang in China. In September 2018, Sandvik AB secured a deal to supply advanced tubes worth USD 55.2 million to the oil & gas industry. The deal was secured in the third quarter of 2018. In July 2018, Sandvik AB secured a deal to supply advanced tubes worth USD 55.2 million to the power & energy industry. The deal was secured in the second quarter of 2018. What are the upcoming hot bets for industrial tubes market? How is the market dynamics changing for different types of industrial tubes? How is the market dynamics changing for different end-use industries of industrial tubes? Who are the major manufacturers of industrial tubes? How is the market dynamics changing for different regions of industrial tubes? 13.11.1 Acciai Speciali Terni S.P.A.
13.11.7 Ratnamani Metal & Tubes Ltd.
13.11.9 Heavy Metals & Tubes Ltd. The study involved four major activities in estimating the current market size for industrial tubes. The exhaustive secondary research was done to collect information on the market, peer market, and parent market. The next step was to validate these findings, assumptions, and sizing with industry experts across value chain through primary research. Both top-down and bottom-up approaches were employed to estimate the complete market size. After that, the market breakdown and data triangulation methodologies were used to estimate the market size of segments and subsegments. In the secondary research process, various secondary sources such as Hoovers and Bloomberg BusinessWeek were referred to for identifying and collecting information for this study. These secondary sources included annual reports, press releases & investor presentations of companies, white papers, certified publications, articles by recognized authors, gold standard & silver standard websites, food safety organizations, regulatory bodies, and databases. The industrial tubes market comprises several stakeholders such as raw material suppliers, distributors of industrial tubes, steel associations, end-product manufacturers, and regulatory organizations in the supply chain. The demand side of this market consists of manufacturers and suppliers of steel, copper, aluminum, and tubes. Various primary sources from both the supply and demand sides of the market were interviewed to obtain qualitative and quantitative information. After arriving at the overall market size—using the market size estimation process explained above-the market was split into several segments and subsegments. In order to complete the overall market engineering process and arrive at the exact statistics of each market segment and subsegment, the data triangulation and market breakdown procedures were employed, wherever applicable. The data was triangulated by studying various factors and trends from both demand and supply sides in the steel, industrial tubes, and end-use industries. Notes: Micromarkets1 are the subsegments of the industrial tubes market included in the report. Core competencies2 of companies are determined in terms of their key developments, SWOT analysis, and key strategies adopted by them to sustain in the market. Total 10 major players covered. This research report categorizes the industrial tubes market based on type, material, manufacturing method, end-use industry, and region. The industrial tubes market has been further analyzed based on key countries in each of these regions.